Cheap! These guys are at the bottom of the cost bucket, at 35 points for a helot, you get a lot of bodies for the fire. This works great in a couple of ways. Firstly, unless it’s a Disciple or something similar, you can easily afford to let someone die if they get critically injured. I’ve fed a couple of bodies to the doctors guts in my campaign, and both times its been easier letting them die and palming their weapons to their replacement. Secondly, the sheer number of bodies you can throw at a mission you actually want to win means you can quickly overwhelm the enemy with the sheer number of actions. Its really easy to throw your 35 point bodies into the firing line, to ensure that your disciples get their turn spot on. Draw the enemy out with a cheap helot cultist to ensure that your heavy stubber wielding boy gets the shot he needs. Thirdly, pad the gang with bodies to ensure that you don’t bottle early. Chuck a few low cost helots with reclaimed autoguns in just to last that little bit longer. In a starting gang, with full disciples and a witch, you can field at least 12 gang members on your first go. Great starting and default gangers. Not having juves is great. No restrictions for the number of Disciples vs other gangers means that you can be confident that any helot will perform as well as the others. Their stat line is pretty damn impressive too. Added to this that Helots replaces Juves when you have a settlement, have a free ganger every campaign phase! So..bit of tinkering in Google sheets gave me the below analysis. Essentially, in each column the best stat across all gangers rosters gets the lower scores (1 being the best such as Van Saar’s 3+ BS as highlighted below). However, I wanted something to validate helot cultists so I removed the secondary stats and focused on core used stats and they did far better. Spawn – another benefit to the Chaos cults is the potential of gaining a free, unpinnable, unkillable, damage causing gribbly worth a good 130 creds. The favoured tactic after the first couple of games is to intentionally fail your ritual roll by stacking your negatives, and getting one of these boys off the bat. In-game, the random stat rolls don’t matter that much as your opponent will dedicate a heck of a lot of firepower to killing this thing. And you do need to take it out of action or this thing will keep wrecking their game! In the wrap up they need to be corralled. 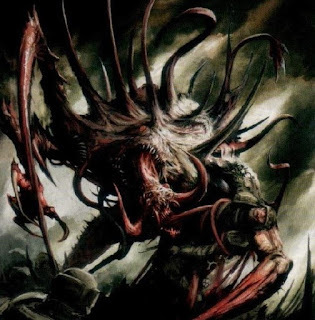 Nominate three cultists which survived the fight and if any of them roll a 4+ the spawn is restrained and can be used again. On a 1, a cultist takes a permanent injury. Familiars – these were an unexpected boon to and benefit to the newly issued codex. 45 creds for a decent likelihood (for Demagogue with a willpower of 6+) of getting a 3+ save , coupled with the other benefits of its skillset for the Witch too is a pretty good investment. 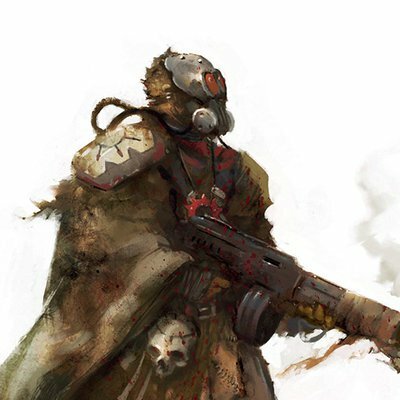 Good Initiative – The helots can move as fast as an escher ganger, and have the same initiative, this counts a lot towards them getting into cover, and getting the drop when needed. They might not have fantastic secondary skills, but the default start point is pretty good. Witches – this is a mixed one. Benefits are champion model, access to savant skills, and a psyker. Negatives are rubbish statlines, and the mixed utility of the psyker powers. On the plus side, these guys as a buffer are a good option, you can go for dark shield which gives guys within 3 inches a 6+ save, or go for levitation so you can run around and help people back on their feet. A medicae bag means he can support from the backfield. If he needs to he can switch to a more offensive powers to defend a point. Savant skill is nice to have, stick ‘Fixer’ on him and get some extra D3 x 10 creds post-battle, try for ‘Connected’ and ‘Savvy Trader’ to get your guys armoured up faster than normal. ‘Medicae’ supports the backfield player-role. Skill trees - Ferocity and Cunning have the 2 best skills in game in my opinion (Nerves of Steel and Infiltrate) and these guys really get the benefit of these across all of their champions (Bar the witch) Savant as primary is really helpful too, a great way to reduce costs for the gang across the board. Summary = These options make these guys a really fun gang to play in the Campaign, loads of benefits they get all come from Campaign play. Play like a cult plays, with bodies thrown at the gun lines fearlessly and try to be off-hand and dastardly throughout, they will undermine, and sneak up on you entirely and win your heart. No armour – The only gang which doesn’t get armour out of the gate. Don’t get me wrong, paying 10 creds for flak still brings these guys into line with most other gangers. 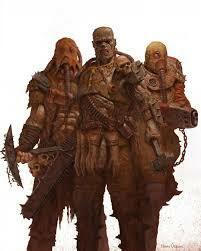 However, throwing bodies at the guns will mean you’re better not armouring these up, as for every 3 cultists you give flak armour (135 points) you’re only 5 points shy of taking a 4th ganger instead (140) in most cases you wont get a save from 6+, either through lack of successful rolls or -1 Ap. Generally, it makes things quicker, and lets face it you’ll want to be in cover anyway. High priced small initial gang armoury – the weapons these guys start with are OK, they aren’t varied enough to really make the gang deadly to start unless you went full melee (Mesh + flail+ flail). You’re going to have to get used to rolling those rapid fire dice with heavy stubbers, and all those auto-weapons. The high price of the weapons on offer often mean you won’t want to give someone more than one ranged weapon, and just the melee weapons. Avoid the Heavy Flamer unless you take Overseer on someone! 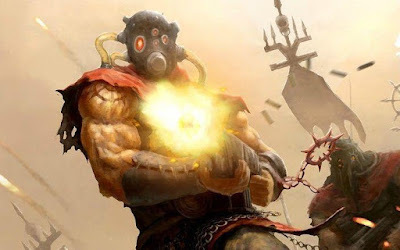 One off gang – We’ve got a free codex. Great. However, until the supposed ‘Chaos Uprising’ Faction comes out which GW have teased, don’t expect much in the way of support for your bodies. We’ve got our spawn, which we shouldn’t complain about, and we’ve got our Witch, which is nice, familiars too. After that, we’re just a (decent) sidenote in Necromunda. Whereas other gangs have a really decent them, our individuality has to be defined by our approach to our gang. I wouldn’t expect someone entering Necromunda to seize upon Chaos Cults as the favoured gang, as the other houses are far more appealing for new players. = These aren’t too detrimental to the starting gang, but will mean that you manage your starting gang slightly differently, forget your armour and you’ll regret it. Ideally, you would have a load of bodies preventing the gangers bottling, and therefore requiring to make a cool check to stick around, but when you need those rolls in-game (for targeting different enemies for example) you’ll suffer badly. Also, bear this in mind when there are smaller scale missions, with a reduced crew. High Leadership, Willpower, Intelligence. Eh, they are worse than the rest of their stats and do not hold them in great stead. These stats won’t crop up very often, but could be really detrimental in some missions when you actually need these stats to progress/better the mission. This one is really worthwhile having combined with all of the Rapid fire dice that you’re chucking around as a Cult gang. Misses aren’t as painful. A card that works well at really stretching your mass activation advantage ever further, keep your guys in hiding and drop this next to a heavy, or in a cluster of guys near cover. Autoguns and autopistols oh my! Another decent one for Cults, purely in the fact that you’ll need to get the drop on the better gangs faster, and as you can guarantee that you’ll get the last activation in a turn, getting the First one with that same ganger is really key. Run your guys up with your guaranteed end-activations, drop this, and then enjoy a few more chances to get closer. All of the hangers on are pretty good fodder, I would suggest the only one you consider most is the Rogue doc, as I’ve found that I either just let the ganger die ( as the cost is often higher than hiring a newbie) or in the case of a Disciple, spend a load and don’t save em! Having this guy around should save a few more than normal. With Cunning and Ferocity, these guys get some niiiiiice skills to start. Lets work through them. High level, best skills in the game are probably Infiltrate and Nerves of steel, both of these the Disciples can take. The sooner these go in the better. For the leader however, take advantage of their Leadership skills, and try for Overseer to really max your heavy/special weapon usage. For the Witch, they get Savant skillset, so I recommended money making things. For the everyday gangers, any of the rolls on the general upgrades table are good ones, with a decent starting statline as they are already, buffing low secondary skills can only make them better. Armour for your decent gangers. Once these guys have survived long enough, chuck them some armour to make them more hardy. I’d plump for the Mesh at 15 over Flak at 10 for 5points of difference. With the cunning and ferocity skillset as their primary skills, the champions should be themed appropriately, give the Heavy better armour and a suspensor, and the sneaky gits some decent close range weaponry (knife for backstab for example). Familiars are a good investment at 45 odd creds for your leader, and can be useful in getting better WP rolls for your Witch. Speaking of your Witch, if you want to take them in-game, gear em with some armour and maybe some grenades as their 5+ bs skill won’t affect them too badly. A decent upgrade for a fighter starting in a gang is the long rifle for 30creds for a grand total of 65 creds. A fighter can sit with one of these out of range, propping up those bottle checks, plinking away at enemies moving at a distance. A couple of these watching the enemy heavies and keeping them pinned are a massive help. 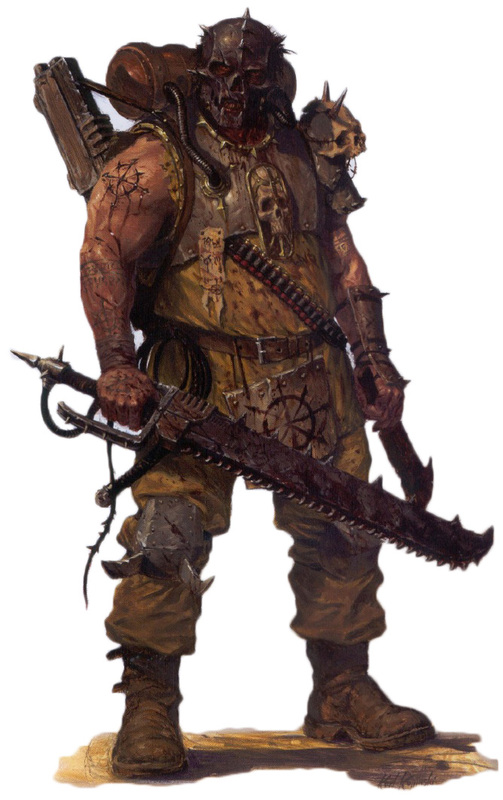 These guys are really strong in the Campaign setting, cheap bodies, good champions, options for development, coupled with decent in-game stats means that if you pick these guys in a campaign setting you will not be disappointed. All praise the dark gods!